Doug Fox and his fantastic team from the Crawley Wheelers deserve a well-earned pat on the back for hosting such a great event over the weekend. This was the first time a National Trophy Cyclo Cross event had been hosted in Sussex and it was a cracker! 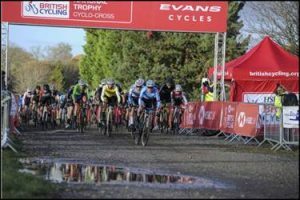 It was round 3 of 6 in the prestigious National Trophy Series and at last “Proper Cross” conditions surfaced. The course was muddy, technical and the rain held off in the daytime and allowed the sun to make a welcome appearance, perfect. Riders, helpers and spectators came from all parts of the country and it was great to see over 600 racers in their various category over the 2 days of competition. There will be many stories to tell from the testing conditions. 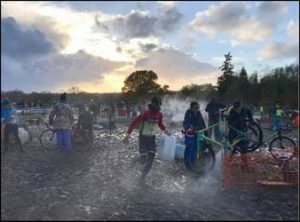 The under 16 categories certainly had the harshest conditions with sticky mud that created a hive of activity in the equipment pits. Stuart McGhee said, “my son, Sam, raced in this race and I was pit crew manager, we had to change and clean bikes every lap. Very testing conditions”. There was a nice touch with a poppy on each riders number as an act of remembrance for the ending of the Great War 100 years ago and we’re sure many of these will be kept as a momento of the day. The race schedule was also changed to ensure that everyone at the race could partake in the 2 minutes silence. A very moving moment! Doug and his team should be very proud of themselves. we at the LCCA certainly are and our South East Cyclo Cross Cycling community are. They have represented themselves to the highest standards and been great ambassadors. 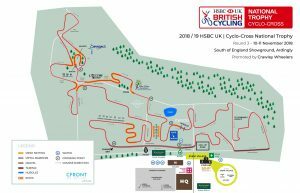 NB: Places for this event will be by selection, with priority given to riders with 20 or more ranking points. It is unlikely that this will impact upon categories other than youth boys and veteran men, however the continued growth in participation means that we are approaching realistic capacity for many events. Maximum field size has been set at 100 for any one category, or a total of 140 where there are two or more waves in the same race. This will be subject to review as the season progresses. Please note that there will not be a reserve list.